Game reviews, previews, notes and features about Furman University football, men's basketball, baseball and other sports. This blog exists as a way for me to continue to cover Furman athletics, which I did for several years for The Greenville News. Special thanks to Furman Sports Information for photo use and to blog sponsor, Tommy's Country Ham House. Coming off a double-overtime win on Saturday in which four Furman players saw at least 44 minutes of action, Paladin coach Bob Richey went to his bench early and often Tuesday night at Elon. 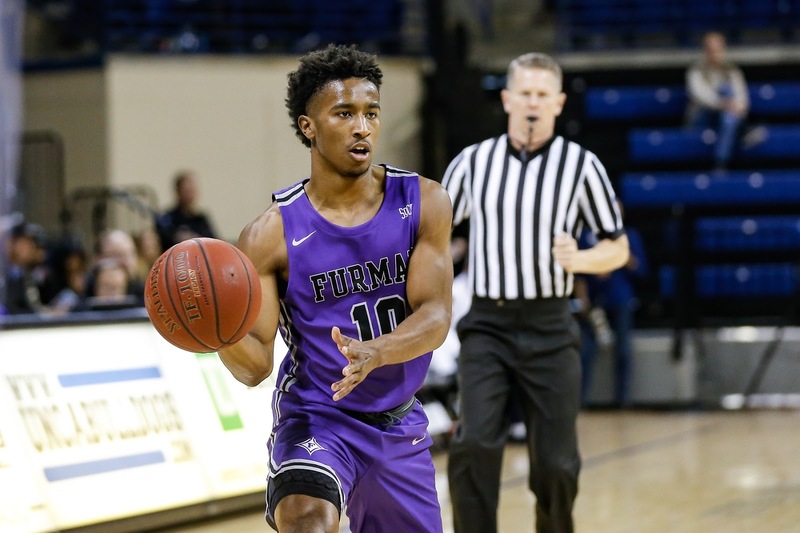 Plenty of Paladins contributed and seven of them scored at least nine points in 25th-ranked Furman's 98-77 win. In their last road game nine days earlier at UNC Asheville, the Paladins allowed the fewest points they had in a road game in eight years in a 65-51 win. On Tuesday, the Paladins scored the most points they've had on the road in 25 years. It was the highest road output since a 103-98 win at Charleston Southern on Dec. 18, 1993. "I think that's one of the beauties of this team. It's really a group that can potentially beat you on both ends of the floor," Furman coach Bob Richey said. "That's what good teams do. It's not are you a good offensive team or a good defensive team. You've got to be complete. "We thought tempo was going to be an advantage in this game. We wanted to get the ball out quick ... and really see if we could get into their legs in the second half. I thought it worked." It's the 15th consecutive regular season win for Furman (9-0) dating back to last season, including its seventh straight road victory. To put that in some perspective, the Paladins won a grand total of eight road games over a four-season stretch from 2012-13 to 2015-16. "To me, basketball's a game of mentality. To go win games on the road, you've got to be that much tougher in your mindset because you've got more things going against you," Richey said. "You've got to make sure that you stick together and battle through adversity." While the Paladins are obviously having a whale of a season thus far, they entered Tuesday having not shot all that well from the perimeter lately. But Furman knocked down 15-of-32 3-pointers, including 7-of-10 from players coming off the bench. 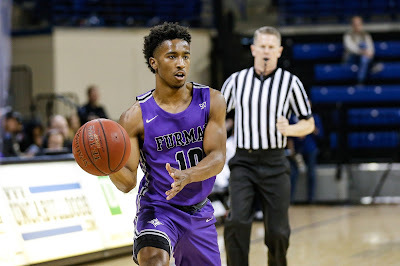 Reserve Mike Bothwell hit a 3-pointer to give Furman a 14-7 lead at the 13:28 mark of the first half, while reserve Jaylon Pugh gave the Paladins their biggest lead of the first half at 21-7 on a 3-pointer less than two minutes later. Pugh went 3-for-3 from beyond the arc, while Bothwell was 3-of-6. Elon (3-6) whittled a 10-point halftime deficit down to three at 55-52 with 12 minutes to go before Furman regained command. The Paladins led 69-61 with 8:26 left when they went on an 18-3 run over the next 3:19. Alex Hunter had nine points during the run as he scored all of his career-high 18 points after halftime. He also had seven assists, four rebounds, three steals and one turnover. Over the last two games, the sophomore point guard has 29 points, 17 assists and three turnovers in 76 minutes of action. "In two games, 17 assists and three turnovers. Where do see that?" Richey said. "There's just certain people who understand what it takes to win. "He's just getting better every time he goes out there. I think he's only going to get better and continue to be more aggressive offensively. I'm really happy to see his progress." Matt Rafferty also had 18 points - on 9-of-11 shooting from the floor. Clay Mounce had 17 points, nine rebounds, four assists and no turnovers. Jordan Lyons scored 13 points and Bothwell had 11. Noah Gurley and Pugh each scored nine points. The Paladins finished with 24 assists, including 17 in the second half as Furman shot 66.7 percent (22-of-33) from the floor after halftime. "Our ball movement was the best it's been all year," Richey said. "It contributed a lot to the perimeter shots." I'm a husband, father and sportswriter with 25 years of experience in the newspaper industry. The Furman Sports Report is sponsored by Tommy's Country Ham House. Tommy's has offered delicious food and friendly service to Greenville diners for more than 30 years. Tommy's is an avid supporter of Furman athletics.